This paper proposes an image descriptor, Gabor Directional Binary Pattern (GDBP), for robust gaze estimation. In GDBP, Gabor magnitude information is extracted firstly from a cropped subimage. The local directional derivations are then utilized to encode the binary patterns in the given orientations. As an image descriptor, GDBP can suppress noises and robustness to illumination variations. Meanwhile, the encoding pattern can emphasize boundary. We use the GDBP features of eye regions and adopt the Support Vector Regression (SVR) to approximate the gaze mapping function, which is then used to predict the gaze direction with respect to the camera coordinate system. In the person-independent experiments, our dataset includes 4089 samples of 11 persons. Experimental results show that the gaze estimation can achieve an accuracy of less than by using the proposed GDBP and SVR. In HCI (Human-Computer Interaction) scenario, eye gaze means the pointer from the viewer's two eyes to an object, and gaze is a very useful natural input modality. Combining with the sign language recognition or speech recognition, eye gaze tracking can highly improve usability for the disabled persons, and meanwhile it can be applied in some special fields such as, ophthalmology, neurology, and psychology. Many researchers in computer vision and pattern recognition community have been focusing on this topic, and some methods for gaze estimation can be found in related literature. These methods, by their approaches to represent the position of a pupil's center in the eye socket, are divided into two categories : model-based methods and appearance-based methods. Model-based solutions, such as, Pirkinje image [2, 3] and limbus tracking , use an explicit geometric eye model and the geometric features to estimate the gaze direction. Appearance-based solutions treat an eye image as a high-dimensional feature, instead of using the explicit geometric characteristics . These appearance-based approaches are usually more robust in experiments by better exploiting the statistical properties. Sugano et al. take the cropped eye region as a point in a local manifold model and make gaze estimation by clustering learning samples with similar head poses and constructing their local manifold model. In the approach proposed by Lu et al. , Local Binary Pattern (LBP)  represents the "pupil-glint" vector information related to gaze direction by obtaining the texture changes of eye images. In , an appearance-based method, Local Pattern Model (LPM), is presented. This model combines the improved Pixel-Pattern-Based Texture Feature (PPBTF) and LBP texture feature. Although the existing appearance-based methods have made significant progress in gaze estimation, their accuracy and robustness need to be further improved. In this paper, we present an appearance-based gaze estimation method based on a novel image operator, Gabor Directional Binary Pattern (GDBP), and Support Vector Regression (SVR) . In GDBP, multiscale and multiorientation Gabor wavelets are used to decompose an eye image, followed by the Directional Binary Pattern (DBP) operator. We use the GDBP operator to represent the texture changes of the eye images caused by the pupil centers which keep moving in the eye sockets, when people at a certain head pose gazes in different directions. With the advantages of Gabor filters  and the local directional differentiation information, GDBP is not only robust to illumination variances, but also with much discriminating power. In applications, these patterns are useful in representing the horizontal and vertical pupil movements. 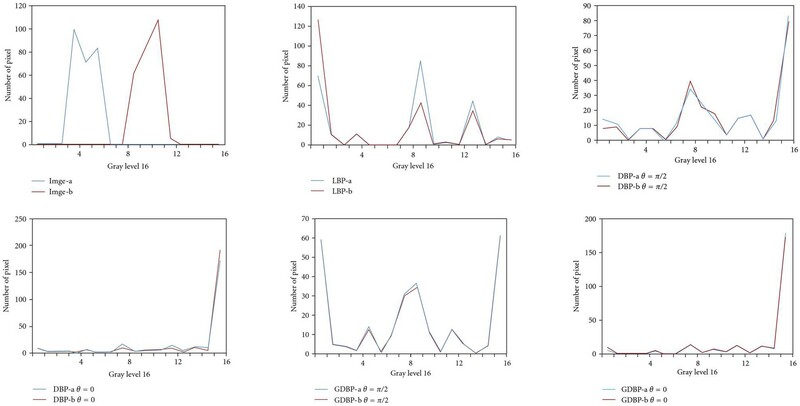 As appearance-based features, GDBP is fed into SVR to approximate the gaze mapping function. The output gaze direction is represented in terms of Euler angles with respect to the camera coordinate system. Our experimental results show the validity of the proposed operator, and additionally we have achieved an accuracy of less than . The rest of the paper is organized as follows. In Section 2, we elaborate the computation of the proposed GDBP operator in detail, as well as some analysis on its robustness to the light variances and its different discriminating power in different orientations. Gaze estimation with fixed front head pose based on GDBP is presented in Section 3, followed by experimental results with comparisons with other approaches. In the last section, some brief conclusions are drawn with some discussions on the further work. In this section, we first define the Directional Binary Pattern (DBP), and then extend it to GDBP, using multiscale and multiorientation Gabor filters. Finally, we analyze the robustness and discriminating power of the GDBP. The details are given as follows. We define the texture in a pixels neighborhood of an image as a joint distribution of the gray levels in the 9 pixels (see Figure 1). is the center pixel, around which are ,…, and . Similar to the LBP operator, DBP encodes the local binary pattern. In addition, DBP also represents directional differential information (see Figure 2). With these advantages, DBP can be applied broadly. A comparison of LBP and DBP. Bottom-left: the input image with the neighborhood of interest highlighted. Top-left: the binary code by LBP. 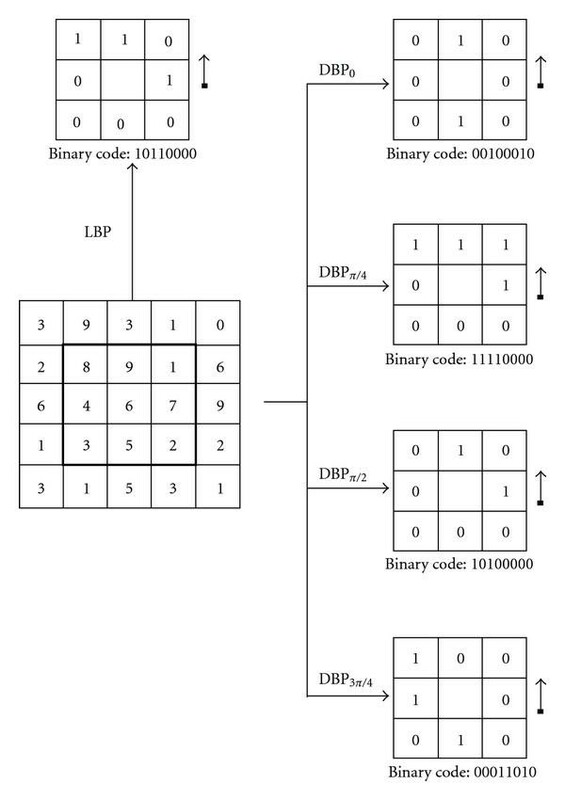 Right-4-rows: the binary codes by DBP. As stated above, a cropped eye image is encoded into GDBP by the following procedures. The image is normalized and transformed to obtain multiple Gabor magnitude maps in frequency domain by applying multiscale and multiorientation Gabor filters. The Directional Binary Pattern is extracted from these maps. We analyze the robustness of the proposed GDBP because a good image representation should be robust to lighting variations. To evaluate GDBP's robustness to lighting variations, we compared the histograms of six representations extracted from the two images of the same eye with different lighting (see Figure 3). In this paper, the parameters of GDBP are set as , , and , for a trade-off between speed and accuracy. 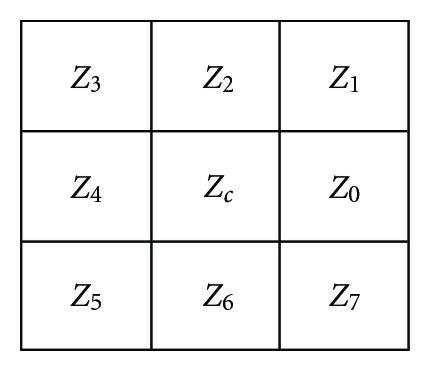 As shown in Figure 4, the six representations are, respectively, the original image intensity, LBP of the image, of the image, and of the image. Two white regions of the same window size pixel array as shown in Figures 3(a) and 3(b) are, respectively, selected to extract different histograms, and the results are shown in Figure 4. We can see clearly that the histograms of are the most similar. We also can see that GDBP has better robustness properties than either of DBP or LBP. This implies that eyelid representation of GDBP is robust to the lighting variations, which can lessen the effect of reflections on eyelids and benefit for gaze estimation. Two eye images from the same subject with different illumination. Robustness of the different histogram to images with lighting variation. GDBP (a, b), LBP (a, b), and DBP (a, b) mean that three operators are, respectively, applied on the white regions of image a and image b (see Figure 3), and is the direction of GDBP and DBP. In the off-line person-dependent gaze estimation, we use three sets under different lighting conditions to evaluate the performance of LBPs, DBPs, and GDBPs. Three data sets are collected from three persons by the method described in Section 3.1. Each set has the 742 samples, Set 1 with the left lighting, Set 2 with the frontal lighting, and Set 3 with the right lighting, as shown in Figure 5. Three sets are cross-validated with each other in order to evaluate the robustness of various features by estimation accuracy. When one is used as a training set, the others are used as the testing sets. The final estimation accuracy is calculated on three cross-validated experiments. From Table 1, there is a similar accuracy between LBP and DBP, while with the advantages of Gabor filters , GDBP has the best robustness to lighting variations. Errors of three gaze directions under three lighting variations (degree). Samples under three lighting variations. GDBP is not only robust to the variations of imaging condition but also with much discriminating power. GDBP has the different discriminating power in different orientations. A white region of the window size pixel array, as shown in Figure 3(a), is selected to extract the gray histograms by . 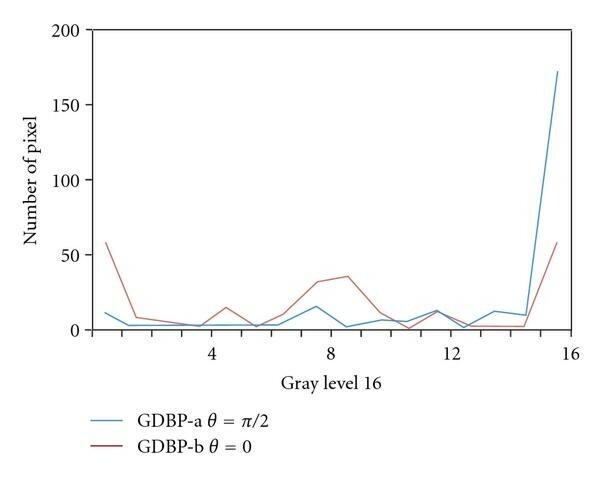 As shown in Figure 6, we can see clearly that the histograms of horizontal and vertical GDBP contain different discriminative information. This implies that the representation of GDBP can meet the special requirements, namely, GDBP is useful in representing the horizontal and vertical movement of the pupils for gaze estimation. Histograms of horizontal and vertical GDBP extract from the white region image as shown in Figure 3(a). Gaze estimation aims to calculate the direction of subject's attention from an image, which is represented in terms of Euler angles between the gaze vector and three axes of camera's coordinate system. In this paper, we apply the proposed descriptor to estimate the gaze direction with a basic assumption: head poses are fixed front view. 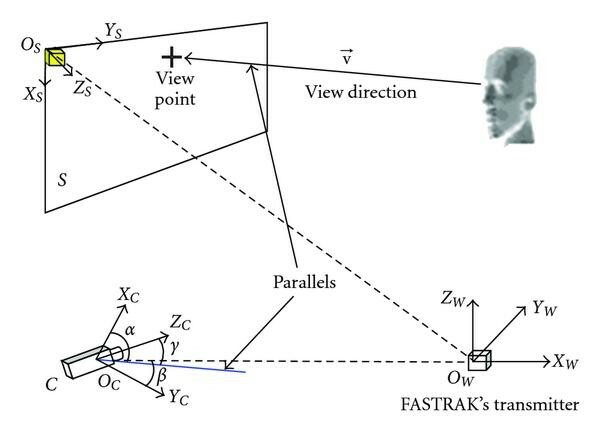 In order to gain the samples labeled by the accurate Euler angles, a designed studio is setup (see Figure 7), which contains a camera for collecting the face images, a monitor as a gazed object and a localizer (a commercial FASTRAK ) to calibrate the objects (user's eyes, observed cursor on the monitor, camera) of our studio. The FASTRAK has a transmitter (the world coordinate system . The origin is located in the centre of the transmitter) and four receivers, and only three receivers are used in our data collection procedure (Each receiver owns a local coordinate system). Three receivers are mounted on the head of the viewer, the camera, and top-left corner of the screen, respectively. The data from a receiver is its position and orientation related to the transmitter, which are six values: in cm, and Azimuth, Elevation, Roll in degree. And then our system can calculate the receiver's translation and rotation matrices related to the transmitter's coordinate system. In Figure 7, one receiver is mounted on the top of the camera, and the output of its translation and calculated rotation matrices are and related to the transmitter's coordinate system. are the axes of camera's coordinate system. Suppose that the translation and rotation matrices from the receiver's coordinate system to camera's coordinate system are and = I (I is a unit matrix), respectively. The second receiver is mounted on the top-left corner of the screen, and the output of its translation and calculated rotation matrices are and related to the transmitter's coordinate system. For each generated cursor as a gazed point, we assume the translation and rotation matrices from the receiver's coordinate system to screen's coordinate system are and = I, respectively. The third receiver is mounted on top of the viewer's head, and the output of its translation and calculated rotation matrices are and related to his transmitter's coordinate system. Assume that the centre of the two eyes has a translation of in cm related to the third receiver ( is a statistical average and the error of different centre can be ignored and tested by the experiments). We keep the direction of the receiver paralleling to the line between the two eyes and the direction upright, and the direction parallels the direction of head pose. 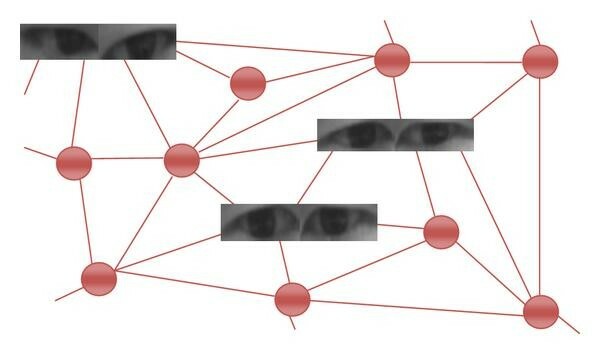 Our system synchronizes the image capturing and the computation of gaze direction. In the data collection, the distance between subject's heads and the screen is around 600 mm. In this paper, in order to simplify the experiments, we keep the head pose in front view by holding the direction of receiver fixed on the top of head. In the data collection, at each time only one of predefined 16 points appears on the monitor and its world coordinate is calculated from the screen coordinate by the translation and rotation matrices. We provide a database for further research. In our experiments, we use the GDBP operator to encode the eye images as the appearance-based feature. Our algorithm gets a captured image as input, and outputs the gaze direction. In our method, the eye centers and the contour points of the eyelids are located by the method proposed in . The eye image is then cropped among the outline points of the eyes (see Figure 8(a)). The cropped two eyes image is divided into 16 nonoverlap rectangular regions. Our experiments show that when a single eye is divided into 8 regions and double eyes 16 regions, we achieve the best accuracy; see Table 2. GDBP features are computed (see Figures 8(b) and 8(c)), where the parameters are set as and . The parameters are so set for a trade-off between speed and accuracy. Gray histograms are computed from each region. All histograms (256 bins) are used to replace the classical "pupil-glint" vector. GDBP features, as well as the histograms, are fed to SVR to predict the gaze direction. In our experiments, we calculate GDBP features only in horizontal and vertical directions to improve the computational efficiency. Errors of different regions (degree). In this paper, we use front view samples for training and testing. The cropped eye sample distribution in the gaze space looks like a net, which is a double unicom space as shown in Figure 9. This implies that the eye gaze is asuccessive movement and we use SVR to map the model of nonlinear successive motion. Our sample dataset consists of 4089 samples from 11 persons. It is divided into three sets: Set 1 with 1666 samples from 4 persons, Set 2 with 1140 samples from 3 persons, and Set 3 with 1283 samples from 3 persons. Our off-line person-independent experiment is cross-validated on the three sets. We compared our GDBP and DBP operators to LBP operator by applying each operator on the same datasets. From Table 3, we see clearly that GDBP performs the best and achieve an accuracy of less than . Errors of three gaze directions (degree). The distribution of eye samples corresponding to the different gaze directions. In real-time application, we can also map the gaze point to the coordinate of the screen similar to the classic "glint-pupil" methods. Our gaze estimation system operates in a desktop environment, and a user sits in front of a PC monitor away from 600 mm to 650 mm. Our system consists of a camera (uEye-1540x) and a Windows PC with a monitor, a 3.0 GHz CPU and 1 GB memory (the localizer, FASTRAK, is not used here). The camera is mounted on the top of monitor. We only need an initial calibration that calculates the range of sight related to the four corners of the monitor. The distance of two eyes' center is used as a parameter according to the depth of field. The monitor is divided into 16 subregions and subjects gaze at the center of each sub-region. The geometric errors are , between the centers of the subregions and the estimated gaze points, for all of the subregions. As shown in Figure 10, one of 16 subregions is in size of pixels whose center is (640, 480) of the monitor coordinate. Subjects gaze at the center of this sub-region while his head pose is front view for simplifying real-time experiment. The experimental results of three subjects show that the accuracy is 85% of the calculated points located in this rectangle, and the points represent a Gaussian distribution. By utilizing the off-the-shelf devices, gaze estimation is executed in 0.85 second from capturing an image to the output of the gaze direction without little code optimizations. Although most commercial gaze estimation solution provides the accuracy less than 1 degree, they usually depend on the assistance of LEDs, as shown in the head mounted EyeLink II . Our method is nonintrusive without any help of LED. The remote monocular nonintrusive gaze estimation is a tendency of gaze research. Left red rectangle is pixels whose center is (640, 480) of the monitor coordinate. Right histogram is a statistical result on 9 subregions (small yellow regions). In our experiments, the kernel function of SVR is the Gaussian kernel function. The sixteen regions of double eye images are used and the average error is around . It is important to note that our eye gaze method is noninvasive, fast, and stable. It is stable due to the robustness of our novel features to the light variances. In this paper, a robust image descriptor, GDBP, is proposed for gaze estimation. GDBP captures not only the local binary pattern, but also the texture change information related to the given directions. Other advantages of GDBP include noise restrain and robustness to lighting variations. GDBP features are finally fed into SVR to estimate the gaze direction with respect to the camera coordinate system. In the future, we will investigate how to match two GDBPs and how to apply the discriminative capacity of the GDBP operator for other tasks.